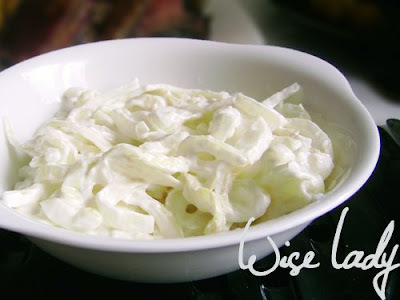 This is a very simple and easy but delicious salad and goes very well with roast meats. 1. Peel the onions, first cut them in half, then cut the parties into thin slices (sorry for your eyes swimming with tears). 2. Add salt and let it stand for about half an hour. 3. Add a few drops of balsamico (optional). 4. Add some sour cream or yogurt. I prefer sour cream to yogurt. Very simple but delicious. Try it!